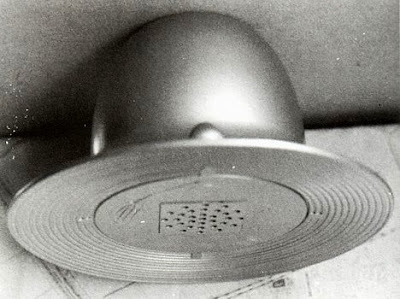 Ananka's Diary: Is This A Mini UFO? IF it was a UFO...THEN WHY DID THEY CAPTURE IT??? That's mean! Just because they're smaller than us, we go around capturing them??? I'm sorry to get so worked up about this, but both my brothers get bullied for even stupider reasons!! Aliens have finally come to eat our brains!!!!!!!!! Run for your lives!!!!!!!!!!!!!!!!!!!!!!!!! sounds fairly realistic... who knows though, i did a course on the universe's rough size and... it's so HUGE!!!! i love gymnast20's idea that they have different senses than us... like in madeline le'angles books. Kirsten, thank you for this awesome tidbit of info! It kinda looks like the evil bowler hat from "Meet the Robinsons". lucky japanese dudes! i want a UFO too. The first thing I thought of when I saw this was the episode of Twilight Zone with the woman whose house gets invaded by miniature aliens. I think that just looks like some sort of inverted smoke detector. But hey, that's just me. whoa! is that a REAL one!?!?! that's cruel if it is To keep it. ummm that just looks like a toy. Ever Read the first Artemis Fowl? Mabey it's like highly advanced Faries. Jk. I think aliens would be, like, extremely cute, and EeViL!! And small. Somthing alomg the lines of a Neon Hampster with huge eyes. speaking of eating brains. my brother found this computer game called plants vs. zombies and it's pretty fun! hmmm......hmmm.... :/ UFFFOOOO RRUNNNNNN FOOOORRY YYOOUURRR LIFIFFFEE! One time when I was on an airplane, I saw a little tiny thing moving around over the clouds. All I could see was a gleam of light floating around. It would be cool if that had been a tiny UFO.